The 150th anniversary of the foundation of Nestlé was a major theme of the company’s shareholder meeting on 7 April 2016. Baby Milk Action/IBFAN-UK and IBFAN-GIFA attended to raise concerns about baby food marketing practices. There were 2853 shareholders present, representing over 75% of votes. Chief Executive Officer, Paul Bulcke, told shareholders they should be proud of Nestlé’s history. Baby Milk Action spoke to ask shareholders to also remember the babies that had died due to aggressive baby food marketing practices that undermined breastfeeding. However, a call for a minute’s silence for remembrance and to signal to the board that practices should change in future was immediately interrupted by Chairman Peter Brabeck-Letmathé. While a few shareholders stood, others booed and whistled. Mr Brabeck defended past practices, such as marketing sweetened condensed milk for infant feeding, as appropriate to the time and ignored the call for Nestlé to stop promoting infant formula today with the claims it “protects” babies and is the “gentle start”. Once again, Mr Brabeck ignored Baby Milk Action’s proposed four-point plan for saving infant lives and ultimately ending the long-running Nestlé boycott. Mr Brabeck misled shareholders by claiming Nestlé had itself proposed and immediately abided by the International Code of Marketing of Breastmilk Substitutes, adopted by the World Health Assembly in 1981. 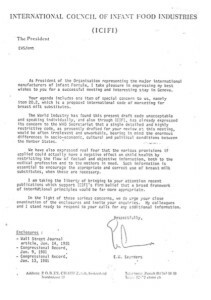 In reality Nestlé opposed it and called it “unacceptable… irrelevant and unworkable” (Right: the 1981 letter sent by Nestlé Vice-President Ernest Saunders on behalf of the industry body opposing the Code). Its policies and practices are still not in line with the Code and subsequent, relevant Assembly Resolutions. At the start of the shareholder meeting, Nestlé showed shareholders a special presentation about the new Nest museum at the site where Henri Nestlé began manufacturing Farine Lactée in 1987. This milk, sugar and flour product was soon being exported around the world in bulk, with claims it prevents diarrhoea and vomiting, so beginning the assault on breastfeeding cultures. 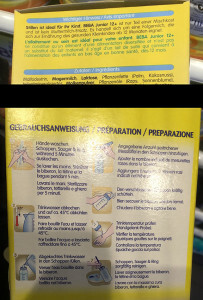 [Above: Nestlé’s history of undermining breastfeeding: “the oldest and most trusted substitute for mother’s milk”, “prevents diarrhoea and vomiting”]. This was followed by sweetened condensed milk, promoted as “ideal for delicate” infants, despite lacking essential vitamins and putting babies at risk of rickets, blindness and death. This was raised with Nestlé in the famous talk by Dr Cicely Williams in 1939 in Singapore called “Milk and Murder”. Although formulations have improved, babies fed on infant formula continue to be at more risk of becoming sick than breastfed babies and, in conditions of poverty, more likely to die. According to the latest Lancet Breastfeeding Series published in January 2016, an estimated 823,000 infant lives could be saved every year though improved breastfeeding. 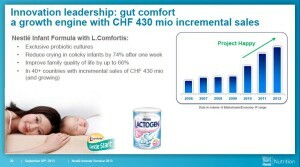 [Below: Nestlé’s presentation to investors in September 2013 describing the “gentle start” marketing campaign as a “growth engine” for sales – click here for a selection of Nestlé labels from around the world]. Mr Brabeck said it was unfair to judge Henri Nestlé’s 1867 product by scientific knowledge of today and that it had saved millions of lives. 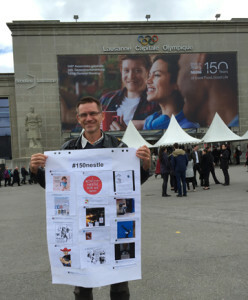 Mr Brady repeated his point that Baby Milk Action’s criticism was about the way products were promoted, which applied to strategies used from Henri Nestlé to Mr Brabeck himself. Rebecca Norton of IBFAN-GIFA, welcomed that fact that Nestlé has finally acknowledged in the latest Creating Shared Value report that WHO recommends breastfeeding after six months, into the second year of life and beyond. IBFAN had told Nestlé repeatedly and over many years that it was incorrect to refer only to breastfeeding in the first 6 months. She asked when labels, advertising and product information around the world would be changed to reflect this change. WHO has confirmed that follow-on milks and so-called growing-up milks are breastmilk substitutes and so should be marketed in accordance with the International Code of Marketing of Breastmilk Substitutes and subsequent, relevant Resolutions of the World Health Assembly. Now that Nestlé has finally acknowledged breastfeeding is recommended into the second year of life and beyond it can no longer claim the formulas it promotes during this period are not breastmilk substitutes. 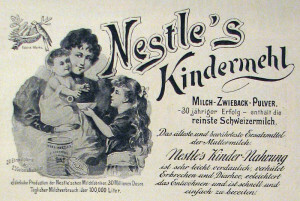 Nestlé products on sale in Switzerland on the day of the shareholder meeting say they are not breastmilk substitutes, despite Nestlé’s change in policy and the fact they are fed in a bottle, which is a surrogate breast. The World Health Assembly said as long ago as 1986 that follow-on milks are unnecessary products (WHA Resolution 39.28). Nestlé also highlighted its inclusion in the FTSE4Good ethical investment index, failing to mention that this does not require companies to abide by the World Health Assembly marketing requirements. Nestlé weakened its own formula advertising policy prior to joining the index, knowing it would be monitored against its own policy – click here for details). Click here for the text of Mike Brady’s intervention and Mr Brabeck’s response. Click here for the text of Rebecca Norton’s intervention and Mr Brabeck’s response. 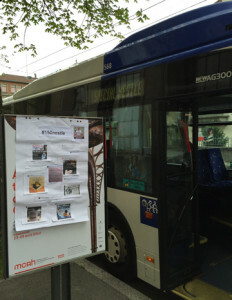 A selection of the messages posted by the public to Nestlé 150th anniversary hashtag were displayed where the shareholder buses arrived (image above and left).